“Integrating planning” can sound nebulous, maybe even unfocused. But when carried out well, the benefits of intentionally seeking to coordinate across different levels of government, sectors and stakeholders, speak for themselves – especially when it comes to sustainable development. A transportation department expands public transportation to connect growth centers set forth in the city’s master plan. The result: higher revenues for the transit system and more compact, connected growth that protects green space and gives more residents access to more opportunities. The water agency in another city works with municipalities to conserve and reforest strategic swaths of land. The result: reduced water treatment costs, lower greenhouse gas emissions and increased flood mitigation. Recognizing the power of integrated planning at the city-level, the Global Environment Facility with support from the World Bank recently launched the Global Platform for Sustainable Cities (GPSC), a knowledge sharing platform for cities to collaborate and learn from curated information and first-hand experiences about low-carbon solutions to environmental challenges brought on by urbanization. 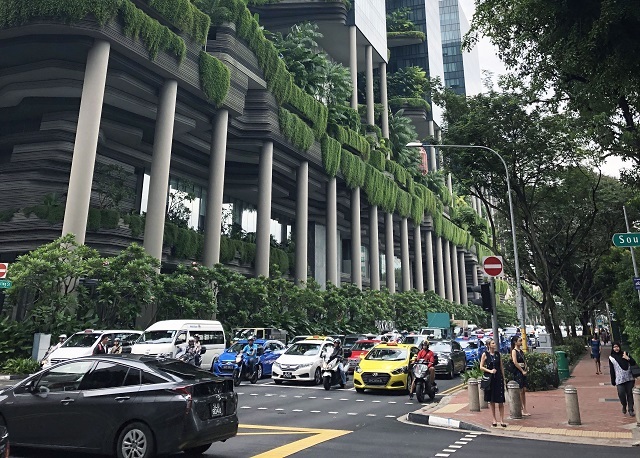 The GPSC City Academy held its first meeting on November 26, in Singapore, where a mix of urban and transportation planners from 10 cities descended on the city-state to discuss lessons learned about climate action planning and transit-oriented development (TOD). City officials came from a wide variety of cities: Ningbo, Tianjin and Shijazhuang, (China); Brasilia and Recife, (Brazil); Asuncion (Paraguay); Dakar (Senegal); Abidjan (Cote d’Ivoire); Johannesburg (South Africa); and Melaka (Malaysia). Climate action planning is an integrated and inclusive strategy that addresses the need to reduce greenhouse gas emissions, adapt to the impacts of climate change, and deliver wider social, environmental and economic benefits. But it’s a largely unrealized idea, so far. Many cities lack a clear implementation framework for climate action, especially with regard to connecting planning with financing. For most cities at the workshop, the incorporation of climate action into land use and transportation strategy is still in the very early stages of development. Some participants proposed linking reductions in greenhouse gas emissions to economic development in some way to provide a more compelling case for taking climate action more seriously. Transit-oriented development projects – a mechanism by which cities increase density around transport corridors while providing higher quality of services and public spaces – are popular. In order to implement TOD projects, many cities want to use land value capture tools, following successful examples such as CEPACs in Brazil. But before getting into relatively complicated land value capture models, such as special assessment districts or tax-increment financing, most cities need to start with the basics. Property tax collection, for example, is the bedrock of municipal fiscal health and can provide a stable revenue source that enables the long-term provision of essential services. Abidjan and Dakar shared their experiences designing bus rapid transit corridors and increasing density in areas with substantial informal settlements. Cities recommended ways to head off problems, like involving the affected population early, minimizing resettlement, and, when necessary, resettling households in the same neighborhood to avoid additional disruptions to economic and social networks. A concrete plan to resettle street-level commercial activity is also key to showing the public the potential for new economic opportunities. Some estimates suggest informal workers now account for 50 to 80 percent of urban employment worldwide. Brasília was built nearly from scratch starting in 1960. Laid out in an east-west axis, crossed by a north-south axis that serves as a transportation thoroughfare and a central business district at the center of the two, its single-use business and residential areas are not well connected via public transportation. But as a well-known example of 20th-century modernist urbanism and a UNESCO World Heritage Site, it’s difficult for the city to make land-use changes. The workshop discussed different options to retrofit public transit systems and increase density in historic areas, including mixing land uses while maintaining building facades and developing new business districts while protecting existing historic cores. Beijing, for example, developed a new business district seven kilometers (four miles) away from the traditional city center to protect the Imperial Palace compound and move high density towers beyond its sightlines. And Paris developed the La Defense district 10 kilometers from the historical center for the same reasons. In each case, the historical core retained a number of more specialized economic activities while the new districts allowed for newer ones, like high tech services and corporate headquarters. Set against the backdrop of Singapore, an iconic example of integrated planning, it was fascinating to see the diversity and commonality of challenges faced by the 10 cities represented at the first GPSC City Academy. A second Academy will convene in São Paulo, in June 2019, in conjunction with the third GPSC global meeting, where a different group of GPSC cities will discuss and work on relevant topics to help them advance their projects and increase sustainability. Mariana Orloff is an Associate II for Urban Development at WRI Ross Center for Sustainable Cities. Andrea Fernandez is Director of Governance and Global Partnerships, C40 Cities. Tsu-Jui Cheng is Program Manager and Global Coordinator, Sustainable Urban Mobility / EcoMobility, ICLEI World Secretariat.